We chose to use this opportunity to investigate this phenomenon and its history with our grade 11 HSP3U/C classes (Grade 11 Anthropology, Psychology and Sociology), through the lens of social psychology. The HSP3U/C course focuses on exploring the human condition on both the micro and macro level where identity and social interactions themes permeate all topics (see previous blog on Language Loss and Residential Schools through the Anthropological Lens). Stanley Milgram’s work on obedience to authority. The fluidity of these roles and how they exist in society in both extreme and moderate circumstances, and more importantly within their lives and their school environment. We have provided a copy of the unit outline here. We begin the unit with a Facing History activity examining Eve Shalen’s testimony on group belonging. Students joined a value line, contemplating what decisions she would make and then reflect on the social costs of group membership. By using this case study as primer for our topic, students are able to see themselves in the decision Eve made, as it is one that faces them almost every day. This activity is related to Asch’s experiment on conformity to the group, and eventually, to the Holocaust. By using an everyday example here, it make the choices made by the perpetrators of the Holocaust more real, as students can identify with some of the motivating factors. They can see how easy it is to be a perpetrator, and encourages them to grapple with their own personal decisions. We begin our second class watching the Choosing Cruelty: The Psychology of the Perpetrator to prime students’ learning. Afterwards, students read through a condensed version of Reserve Police Battalion 101 and respond in a silent conversation using the big paper teaching strategy. Students connect their reactions to the video, as well as learning from the previous day in order to understand the decisions individuals made. When we did this lesson in our classrooms, our students grappled with the horrendous decisions made, with the reality of group conformity, and strong connections were made to all sources. This was an incredibly authentic learning experience for students. Something that really resonated with students was the conformity and cruelty is usually not one monumental step, but a series of many small steps, establishing a “new normal” again and again. This conclusion was strengthened even further as we examined the bystander effect with Kitty Genovese and John Darley and Bibb Letane’s social psychology experiments. Students were able to expand their knowledge in the reading No Time to Think, as they examined the reality of the role of the bystander, and the impact that bystanders have on continuing the perpetration of violence and hatred. The power of a single voice was a constant refrain as students considered why people chose to remain silent. This connection was extremely powerful as we followed the American 2016 election at the same time, and many contemplated the silence by so many people on key issues such as violence against women, xenophobia and anti-immigration sentiments. Some students voiced that by being bystanders, we risk making this behaviour and rhetoric the “new normal”. The following day we begin class with two famous quotations: “The only thing necessary for the triumph of evil is for good men to do nothing” from Edmund Burke and "The road to Auschwitz was built by hate, but paved with indifference" from Ian Kershaw. Sometimes the best discussions come when students are moving around, stimulating their brain. With this in mind, we ask students to walk around the classroom, popcorn sharing (at random and in succession) with their peers their personal responses to the quotations. This allows learners to further their analysis and interact with different perspectives. Using their prior knowledge, students are able to make connections to their own lives and experiences, reflecting on inequalities they see daily both at school and in the media. Throughout the rest of this mini unit, we continue to reference these quotations in our class activities as we explore how social psychology can be used to explain the choices made by perpetrators and bystanders during Holocaust. This exploration concludes using the short film “Pigeon” to discuss the fluidity of roles between bystander, victim, perpetrator, and upstander. Lastly, we end the unit with a four corners discussion activity. First we ask students to individually create a pie chart and split it up according to which social psychological theory they believe is the most influential in allowing the Holocaust to occur. After this individual reflection, students walk to the corner of the room that reflects their top choice. 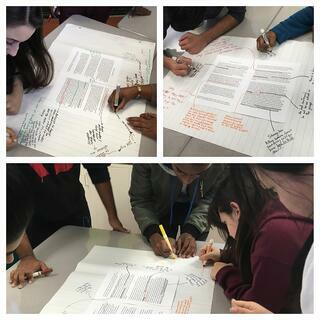 The ensuing discussion allows students to consolidate and refine their previous learning and understanding around the social forces that influence behaviour particularity to the extreme extents that we the world bore witness to during the Holocaust. Our hope with this course, and these combination of lessons, is to use the social sciences to help students be critical thinkers about the world around them, to investigate the decisions they make in their own lives, and intentionally choose to be everyday upstanders. Our students are increasingly faced every single day with decisions on how to react to inequalities and injustice. By incorporating the Facing History pedagogy with the social science curriculum, students are able to see their lives reflected in their learning. We have intentionally incorporated opportunities for students at the end of each unit to choose to participate in the world around them, giving them the chance to put to use what they learn. 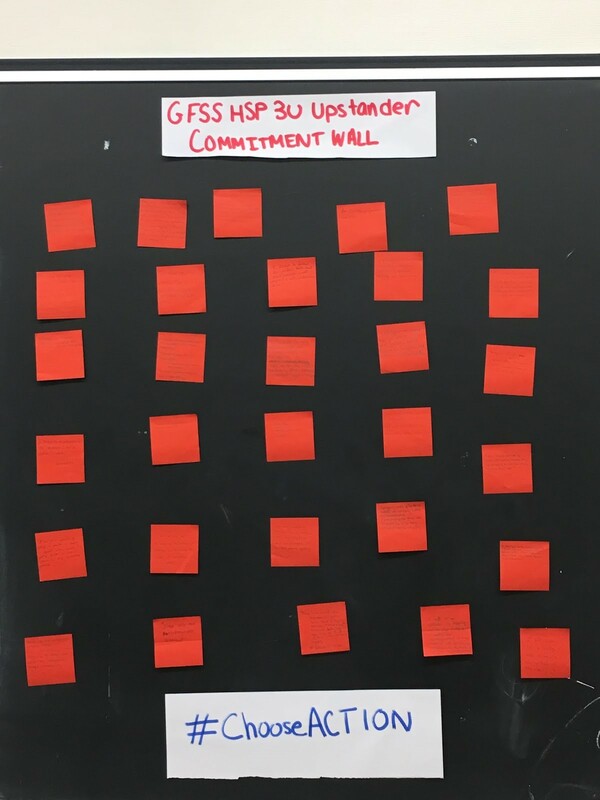 To end our social psychology unit, students made pledges to be upstanders in our school, and tweeted their promises to our school and our board. Students pledged to do things like stand up to bullying, calling out discriminatory words used by their friends and making an inclusive space for all. We were really able to see the impact of this resource in our class and our school. How do you give students the opportunity to practically act on what they learn in your class? What chances do you give your students to choose to participate in the world around them? Co-Written By: Kristen Drury is a history, social science and ESL teacher with the Peel District School Board. She currently teaches at Glenforest Secondary School. Kristen is passionate about finding ways to help students engage with history and wants them to feel challenged to take action. She strives to find new ways to incorporate inquiry based learning and critical thinking into her teaching practice. Follow her on twitter at @Ms_Drury.